This article was written for my friend Mandy, over at MommaSociety.com. The best kitchen tools adds up to less time in the kitchen and less work. Which can mean more time for self care. Ease around homemade food is especially important if you feel determined to eat healthy as you welcome your new little one and say goodbye to long stretches of sleep. Working on that perfect latch, managing mastitis, figuring out how to soothe a colicky newborn, or recovering from a few stitches takes a whole lot mojo. And let’s face it – a sugar rush and caffeine high will only get you so far. Food made with whole ingredients – #realfood – is really good for you. And when you make food at home, you know exactly what goes into it. Aside from edible gifts from friends and family, you may find yourself fin the kitchen – trying to quickly grab a bite. And when you do, you’ll want a handful of good kitchen tools nearby. Ask anyone who owns one – they will confirm: The Instant Pot is AMAZING. It’s what would happen if a microwave and slow cooker had a baby. Tons of flavor and deep nutrition, in minutes. The Instant Pot can break down notoriously tough cuts of meat – like brisket or shoulder – in under an hour. These tough cuts also tend to cost less. It will quickly braise veggies. And if you want to whip up some postpartum broth, try this recipe in your instant pot. Set it to cook in high for two hours, rather than twenty-four. One big reason why I think every new mama need an Instant Pot is because broth can be especially restorative as you recover from delivering your baby. When made with marrow bones, broth can boost energy and mitigate the effects of blood loss. When made with joints and other fibrous bits of tissue – including chicken feet (ack! But if interested, you can get them at most Whole Foods) – it can help your skin heal. Throw in a knob of ginger and a teaspoon of coriander and fennel for a little breastfeeding support. Get the Instant Pot here. ….and your freezer. Yes, your freezer is a kitchen tool. And if you use it, it can save you time, energy, and money. How great is that? The best way to use your freezer is to prepare meals ahead of time. Seriously, it makes life SO MUCH easier. Even planning food a week in advance – and building a cache of homemade food in your freezer – will save you time in the long run. Make extra and freeze the leftovers. Batch cook broth, casserole, and lasagna. Chop, quickly steam, and freeze veggies so they’re easier to use at a moment’s notice. Keep frozen fruit in your freezer for a quick smoothie. If you have an Instant Pot, freeze leftovers and other liquidy foods like stew, soup, and chili into large, round glass containers. You can put frozen food directly in an Instant Pot, no thawing necessary. Just be sure to not place the glass directly in the Instant Pot. Instead loosen your food by running the bottom under cool water until it melts enough to pop out. Personally, I’m a big fan of glass or food-grade silicone over plastic. This is because plastic leaches chemicals into food and water that act like estrogen. Postpartum and pretty much anytime, the LAST thing I need to deal with is some sort of mysterious hormone imbalance. So, I avoid plastic as much as possible. The best time to start using your freezer is before baby arrives. The next best time is when a friend or family member is over and they don’t mind helping out in the kitchen. Get freezer safe glass storage here and here. And if you feel like glass is too cumbersome, try these silicone storage containers. Some sort of blending gadget makes cooking feel fun and successful. You can pack a whole lot of flavor into dressings, sauces, pastes, marinades, and pestos. And who doesn’t love a good smoothie or quick and thick “nice” cream? With enough room to blend – as in, not packed tight – and plenty of liquid, a hand blender can be extremely convenient. Mostly because it’s light, day to clean, and doesn’t have several parts. No, it cannot do everything a high quality blender or food processor can do. But if you’re looking for easy flavor or a quick power packed smoothie, a hand blender will get you there. Get my favorite handheld blender here. I don’t know about you, but cutting something with shears feels like a lot less work than chopping it. Kitchen shears fall into that group of kitchen tools that make life easier. While they’re often used to break down poultry and crack lobster claws, I use mine for less daunting tasks. Like quickly snipping through herbs, spring onion, and other thin veggies like bell pepper or sun-dried tomatoes. For trimming the ribs from kale and taking off broccoli tops. For cutting bacon into bits. And for opening jars. This kitchen tool is a far cry from the techy gadgets that might fill your cupboards. It works on gravity. But don’t let its simplicity fool you. As water filters go, it’s one of the best. Removing all traces of chemical pollutants and heavy metals like lead, mercury, and fluoride. Simply fill with tap water and the let the Berkey work its magic. For breastfeeding mamas, water is lifeblood. It keeps you from feeling dehydrated and helps keep milk production up. What’s more, many of the chemicals in tap water can end up in breast milk. And a high level of contaminants isn’t uncommon. According to the Environmental Working Group (EWG), tap water from the city Los Angeles has 21 contaminates and five are above health guidelines. You can enter your zip code and find out more about the tap water in your area here: EWG’s tap water database. If you use formula, make sure you use filtered tap water over bottled water. Popular brands of bottled water may just be processed tap water and contain many contaminates that aren’t safe for baby. Get the Berkey water filter here. 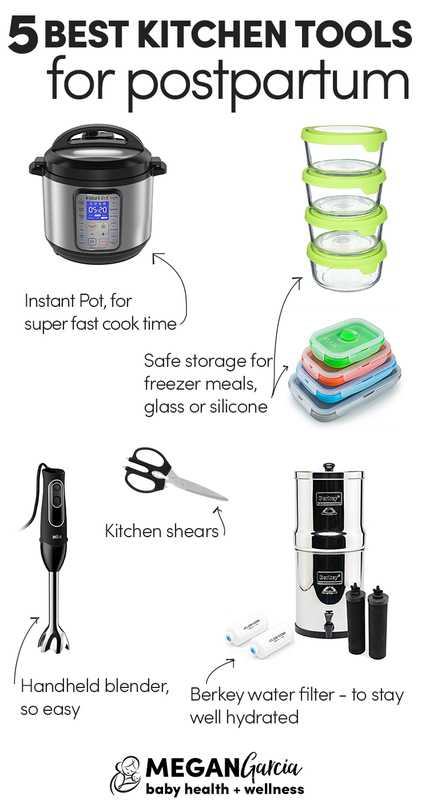 What do you think the best kitchen tools for postpartum are? Share in the comments!